I was fortunate enough to get my hands on a pre-production X-T1 at CES in early January, and have a play with it, and the new 56mm f/1.2 Lens. Size wise, the X-T1 looks like someone took a pro Canon or Nikon DSLR, and downsized it to 85% – it’s smaller, yet perfectly proportioned. 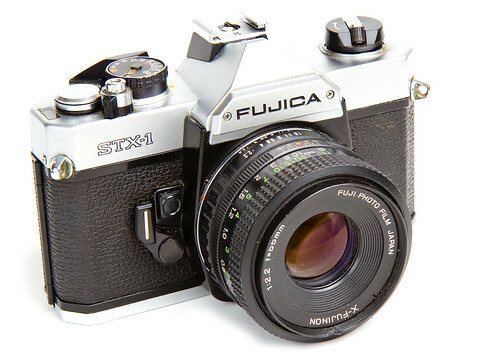 Style wise, the X-T1 has a great retro look to it, and really reminds me of my first 35mm SLR, the Fuji STX-1. The X-T1 has a black finish which looks to be more durable than the paint finish on the X-Pro1, and feels more rubberized – That’s probably the weather proofing material. It certainly has a nice grip to it, and looks and feels like it would wear very well. The camera feels very solid, it has a nice heft to it as you pick it up, and it does’t creak or flex – this is a quality chassis. Yet it not heavy either. I put down my X-Pro1, and picked up the X-T1, and I noted it had just slightly more weight, which I put down to the grip and extra battery. 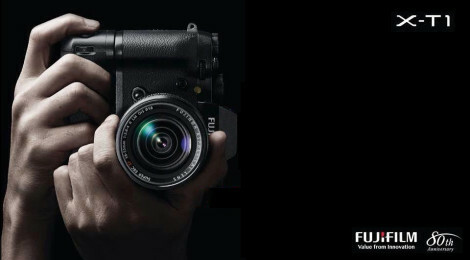 I think Fuji are conscious of lower weight being a key factor in attracting people to their X-Series models vs FF DSLRs. The lockable top-plate controls now include an ISO dial, a welcome addition to the retro styling – you have your standard shutter speed dial, exposure compensation dial, mode dial, and (alleluia) a diopter adjustment knob on the side of the EVF housing. The shutter release doesn’t have a screw thread for a manual remote release – I can see this piece of retro being something that just doesn’t stack-up for a ‘pro’ model moving forward – I’m sure there will be full electronic remote release capability. (I didn’t have time to check this on the demo model). There’s also an optional grip that fits onto the bottom of the body – it’s a proper grip, one with a grip and controls/shutter release for portrait orientation shooting – studio/wedding/portrait shooters rejoice! Looking around the back of the X-T1 body, we find a nice large 3″ LCD, and it’s tilt-able – Fuji have been listening – this will be very useful for shooting low down or overhead. And it’s big – a very worthwhile upgrade from the X-Pro1. The command dial looks familiar enough – the SD card door has moved though, and is now located on the side of the body. Again, thank goodness Fuji have been listening! The grip screws into place with a built-in set screw and knurled knob – it has a set of electrical contacts which mate with a slot on the bottom of the X-T1. This slot is covered with a rubber plug when the grip isn’t used, and this plug has a storage slot inside the grip, so it’ll never get lost when the grip is being used. The grip has controls on it for portrait shooting, and an extra battery compartment for the 2nd battery – the battery is the same as the X-Pro1. The demo unit didn’t have a battery charger with it – but I did point out to Fuji that a dual charger would be a good idea at this point! There’s a hot-shoe on top of the EVF housing, but no built-in flash. There is however a clip-on flash that comes with the camera, and it’s powered by the camera. No extra batteries required. So a hybrid flash – they could’t fit a built-in flash into the camera, because the new electronic view finder takes up all of the space in the ‘bump’. The clip-on flips up to get some separation from the lens axis, so should provide the ‘must have a flash’ crowd with a usable work around. I think it looks rather awkward on such a beautifully designed camera. Fuji really need to step-up and produce a pro flash system to match the X Series, and this is one area where the X-Series is still sadly lacking. My first impression looking through the EVF was WOW! It’s huge – and bright – and detailed, and refreshes really quickly. It’s the best I’ve seen in any camera to date. Diopter adjustment is built-in, the adjustment knob is on the side of the EVF housing, so no-more screw-in diopter lenses are needed. The built-in rubber eye cup felt comfortable to use (I’m a non glasses wearer), and is a real step-up from the X-Pro1 style viewfinder. The EVF display has the usual head-up display of key camera settings around the perimeter, but with the X-T1 this HUD data rotates as you move the camera from landscape to portrait. Now that I’ve seen it done this way, I wonder why manufacturers didn’t do it this way on all models? Switching to manual focus brings up a picture in picture (PIP) window on the EVF – a zoomed area of the image, so that you can see the detail for manual focussing, at the same time as seeing the whole image for composition. MF was easy to achieve, and uses new colored focus peaking to aid the process – again, Fuji have been listening to their customers. I was able to manually focus at f/1.2, on the fabric pattern in a dark suit, and nail a sharp shot every time – can’t say fairer than that for a quick test. This is the best focus peaking implementation I have seen to date. The sensor is said to be the same as the X-E2, the X-Trans CMOS II, so expect better IQ than the X-Pro1 out of the gate. Because the unit I tried was pre-production, I was not allowed to download any image files to review later – we’ll have to wait for the official test images and early release units. AF is said to be better than the X-E2, and in the short time I used it it performed flawlessly. I was only able to test the camera in a closed room at CES, as it was still under-wraps, so further AF testing will have to wait until I can get a unit out in the wild. I want to test the new focus tracking feature, and see if it can deliver – the X-Pro1 was poor in this area, and improvement would be very welcome, and open up further shooting opportunities. AF performance has been a real issue for the X-Series getting traction, and improvements have been steady via new firmware and better lens design – but a step change is needed to really attract mainstream DSLR users. Fuji have also packed an intervalometer into the X-T1, and I was told it had full Wi-Fi tethering, although I wasn’t able to test these features for myself in the limited time available. Both of these features should appeal to pro shooters – and both features have been on the ‘want list’ for firmware upgrades to the X-Pro1 / X-E1/E2 etc. I was able to compare the X-T1 with the Nikon DF at CES – I walked from the Fuji demo room, across the floor to the Nikon booth, and picked up the DF. The Nikon felt HUGE by comparison! It underlined for me why I personally like the smaller CSC format, and reminded me of how far Nikon (and Canon for that matter) are behind the curve on this one. The scale of the X-T1 is right in line with the X-Pro1, X-E1/E2. The fit and finish are superb, this sets a new standard for the X-Series, and probably for CSCs in general. The Nikon DF was very ‘plasticy’, if that’s a word – the X-T1 felt far better made, and solid in every respect. I think Fuji out Nikon’d Nikon there. For retail, the X-T1 is available as body only, or as body and lens kit options. At least one of the kit zooms will be weatherproofed, but they didn’t have this lens on hand for me to demo. I think this camera is a game changer – it builds on the X-Series DNA, whilst pulling-in legacy DSLR users with it’s retro SLR styling and central, class-leading, EVF. I sets the bar high in this market sector, and gives the pro shooter an alternative to their DSLR kit, whilst giving the rangefinder style shooter an alternative SLR body that uses the same excellent lenses. Thanks Chris. I wanted to dislike this camera but the more I read the more I’m considering it as a replacement for my XE1. There’s a lot to like – It seems that Fuji have really been listening to their user base. Hello, I am wondering about the shutter noise of the X-T1 versus the X-E2. I was in a situation recently where I could only shoot the X100s because any noise at all would have been inappropriate. This aspect of cameras doesn’t seem to receive much coverage, so please… if you can find out I would be grateful. My theory is that the rugged body of the X-T1 could either exaggerate or suppress the shutter sound relative to the X-E2. I’m not expecting it to be as quiet as the X100s, but any improvement would be very welcome and probably enough incentive to upgrade. If it is louder I will definitely stick with the X-E2, which as far as I’m concerned sounds like a locomotive compared to the X100s and Sigma DP3M that I use. Well, I shot the camera and the shutter noise never registered, so I guess it’s not loud or I’d have noticed. X-100 is a leaf shutter, so is nearly silent – difficult to beat!! Thanks for the quick reply! If you find out more and happen to remember this question, I’d appreciate the update. Thanks for asking this question John. I too am very interested in the sound of a camera. Many of my jobs demand utter silence and I am delighted with Panasonic’s silent mode but I love the the Fuji cameras (Ever since the Fuji ST-701). Mirrorless cameras hold the promise of potentially being silent but so far few manufacturers other than Panasonic have made any efforts to that end. I hope the very strong negative response to the Sony A7/R cameras and their noisy shutters creates a new feature awareness about cameras other than the preoccupation with weather-sealing or the presence/absence of built in flash. Have to say that this is the first digital camera that has interested me since I hung up my old ’70s and ’80s Nikons. Just pre-ordered and waiting with high expectations. Nice write up….. I’ve also got my order in for the X-T1 + Vertical Grip and 56mm…… I got carried away!! This looks like a long term camera, so many features. I’ve seen the tethering app and it looks good for a first release. This was one thing I missed when selling my 5dmkii. There are so many new features that will be very welcome for studio work. Hi Chris, thanks for the excellent pre-view on the X-T1. As you may know I shoot a Df along a X100 and X20. The Df is great but I’m tempted by this new X-T1 and the new lenses. Looking forward to your X-T1 images! Thanks Luc – I’ll post them as soon as I get my hands on the beast! Does the flash work while the camera is in continuous drive mode? I am a nikon user D4 and a D3s. I am considering dropping my D3s and going with the fuji as a backup. I can’t wait to see what Fuji does in the future.